GREENVILLE, SC, October 12, 2012, Christopher A. Hartwick, Designer with Creative Services at Bob Jones University, has been recognized by Elite American Artists for dedication, achievements, and leadership in advertising and graphic design. Mr. Hartwick is the Graphic Designer for Bob Jones University, and he also does oil paintings which are displayed in galleries. Growing up, people were impressed with his artistic ability. His perspective changed while studying at Bob Jones University, where he became inspired to switch from education to graphic design. Because he is afflicted with arthrogryposis multiplex congenita, Mr. Hartwick used his mouth to create his artwork. He won several awards for his pieces in a number of community competitions. 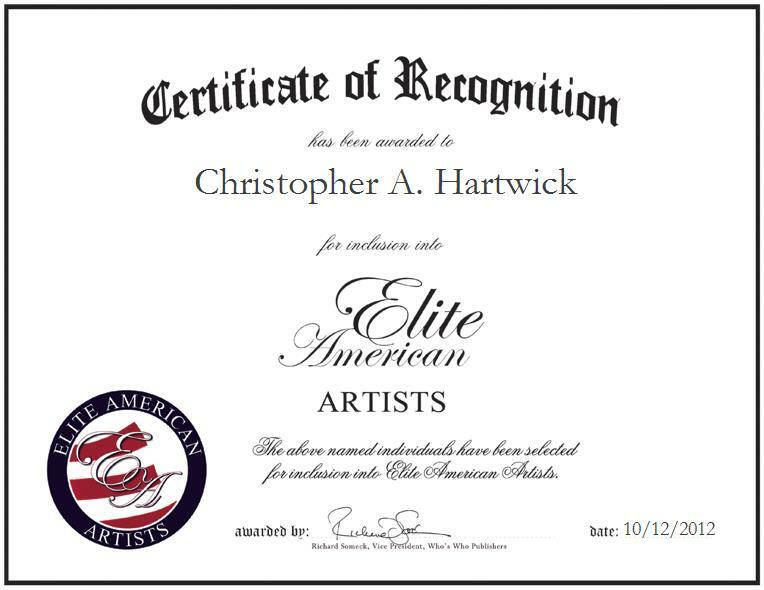 In 1997, Mr. Hartwick was accepted as a member of the Mouth and Foot Painting Artists (M.F.P.A.) based in Liechtenstein, Europe. M.F.P.A. is an organization that helps disabled artists to become more self-sufficient by displaying and producing their work around the world. Mr. Hartwick has had six of his drawings published as greeting cards. He uses ballpoint pen, gouache, and watercolor in his artwork, which can be viewed at the Artists Guild Gallery of Greenville, downtown Greenville, SC. He received a Bachelor of Science in Graphic Design from Bob Jones University in 1993, and he is a member of the Mouth and Foot Painters Association, Upstate Visual Arts, Co-Op Gallery Greenville, and the Artists Guild Gallery of Greenville. Mr. Hartwick has served as an artist with the university for 19 years, and as a designer for the past six. He recently became Member at Large and a Board Member of Arthrogryposis Multiplex Congenita Support, Inc.
Mr. Hartwick was also named a Professional of the Year in Advertising & Graphic Design by Worldwide Who’s Who. Through it all, he pinpoints his greatest professional achievement as having seven of his art pieces published through the Association of Mouth and Foot Painting Artists. He would like to be remembered as a spiritual person who persevered and used his God-given gift to its fullest ability. He overcame the limitations perceived by others to break through barriers to be successful.